Password protection in the Volunteer Reporter is set up right inside the Reporter. You can do it yourself. Go to the File menu | Passwords. Click Yes to "Do you want to use passwords when starting the Reporter?" Then add yourself as the master administrator by clicking Add User. By default every section is set to FULL access. That's how it should be for the administrator. When you first click on Passwords, you are asked whether or not you want to use passwords. If you don't want to use passwords no one will be asked for their username and password when starting the Reporter and everyone will have full access to all data and the entire program. Access levels for every section of the Reporter can be customized for each user. You can give a user "read only" access to certain parts of the Reporter and no access at all to others sections. It is fully customizable for every user. Read Only access means that a user can look at the data, but not change it. No access means that they can't even look at the data in that section. There is no Read Only access to the sections Backup, Restore, Reindex Data, Passwords, and Delete Old Data. For those sections Read Only is the same as None and although you can assign someone Read Only access to those sections, they won't have any access. 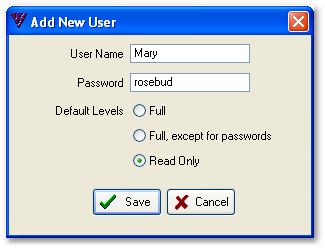 When starting the Reporter, users are asked for their user name and password which are not case sensitive so they can have Caps Lock on or off.